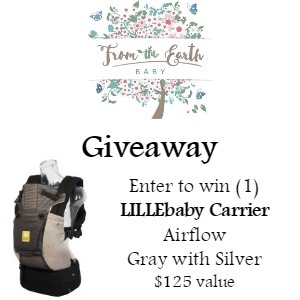 I'm excited to share the opportunity for you to win a LILLEbaby Complete Airflow Gray with Silver. Don't forget to use code FOX15 for 15% off! The LÍLLÉbaby COMPLETE baby carriers combines more positions, lasts longer and includes more features than any other baby carrier. The Airflow line features 3D breathable moisture-wicking mesh for maximum airflow and ventilation to help both baby and parent stay cool. Check out our review! I did not receive anything to share this post. If you have an issue with this giveaway please contact Danielle from MamaTheFox.